This seven day six night trip is for the adventure that feels more at home in the wilderness then in town. On the Mountain Man trip we progress through the wilderness and stay in at least three different camps. Trips generally depart on Monday, but we can tailor it to meet your situation. One of our past guests kept a journal on this trip. I will let her tell the story. Day 1 - Monday July 15th: Our long awaited Colorado vacation is finally here!!! I am anxiously waiting to see my horse. We were here 2 years ago, and I fell in love with a paint filly that had one blue eye. The outfitter said he would reserve Missy for me again. Last time we only went for 3 days and decided that just was not long enough. We are going to be gone for a week this time. Jay said; there would be two other couples on this trip, I hope they like to ride. We were picked-up at the motel about 7am, it is about 8:45 now, and we are almost there. When we arrived, I could see Missy tied to the hitching rail. I went right over to get reacquainted with her, I think she remembers me!!! Got to camp late that afternoon, it sprinkled on us on the way in. One of the other guests left his slicker in his bag on the packhorse and one of guides had to let him use his. We had the biggest steak I have ever seen for dinner. I wasn’t too hungry; I guess it was the altitude. Jim said there was a herd of elk down the valley, I was to busy bonding with Missy. Day 2 - We are staying here today and going for a ride toward Wetterhorn Peak, We saw a mountain goat today; at least that’s what the guide said. It just looked like a white spot on the mountain to me. We are going to be back early today so we can go explore around the Silver Jack Mine ruins. Day 3 - We had to get up early today, we are moving camp. This is exciting because we were here for such a short time last time; that we had to stay in the same camp. We had a great day except for a little rain, and the ride was more breathtaking than Jay had said. We are now in the Big Blue valley or as the guides call it, “The Blue”. It is beautiful here. Day 4 - We are going to stay here for a few days. Everyone is a little slow getting around today. The couple from Ohio said they were going to rest today and enjoy the scenery. The rest of us went for a ride to El Paso Creek. We saw a lot of elk and heard the elk making calls. It was a great ride; we were all back in time to take a solar shower and clean up a bit. 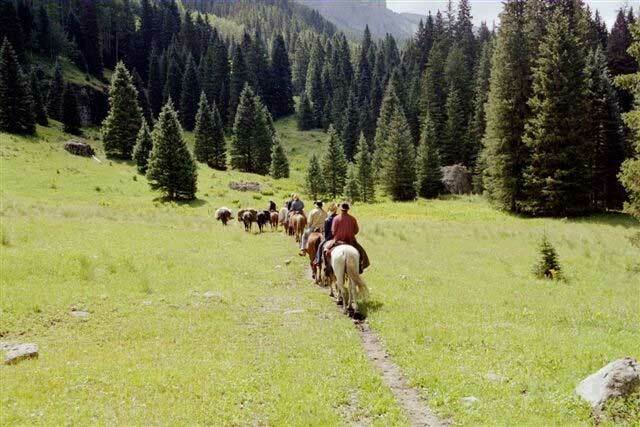 Day 5 - The men went down stream to fish while the women went for a long horseback ride on the Ridge Stock Driveway. I guess this is where they used to trail sheep across. I am going to have a hard time giving up Missy at the end of trip; I wish I could take her home. The men had a good day fishing. Jim said that one of the guys was a real good fly fishermen and he caught and released more than everyone else combined. Day 6 - We are moving today. It was another great day. I love watching the pack string. Two mules are characters they come up form the meadow each night and see what they can find to get into. I can’t believe we have to leave tomorrow, it seems like we just got started. We went for an evening ride after dinner and saw over a hundred head of elk. Day 7 - Well it’s time to pack up and go home. I wonder if I can sneak Missy out of here without anyone knowing. The trip back to the trailhead was too quick for me, everyone was talking about showers and real beds, and all I could think about was going back to the real world and leaving my horse. Since I could not sneak Missy away, I guess I will have to come back and see her next year. What a great trip!